Lieven‘s recipe: Feeds more or less ten people! Season the meat, except for the sausages or meatballs, with pepper and salt and cook in butter until golden brown. Put the meat in a big cooking pot and cover with the vegetables, except for the potatoes and the cabbage. Cover everything with meat broth and let simmer. When the meat is tender, add the sausages or meatballs, the potatoes and the cabbage. When the potatoes are tender, the dish is ready. You could also add lamb shank. P.S. : I should add, no I must add that this meal tastes even better the second day! 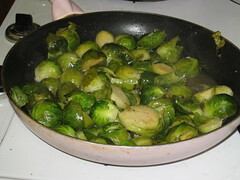 This entry was posted in Miscellaneous and tagged Broth, Brussels sprout, Cabbage, lieven, Meat, Meatball, Potato, Sausage. Bookmark the permalink.